• Zack Greinke was finally placed on the DL with a strained oblique. Greinke initially injured the oblique in his start last Tuesday against the Phillies and had to exit that game after throwing a few warmup pitches in the third inning. He had hoped to miss just one start — Tuesday against the Padres — before returning next weekend against the Giants in San Francisco. An MRI taken Saturday confirmed the strain, and the team decided to err on the side of caution and put him on the DL. Reading into the preceding quote, it seems like the Diamondbacks are expecting him back soon, but I could see the oblique taking longer to heal. Normally a pitcher takes a month to return from an oblique injury. • Jordan Zimmermann is on the DL with a strained neck which he had dealt with for a while. The Tigers placed right-hander Jordan Zimmermann on the 15-day disabled list with a strain on the right side of his neck on Monday, a day before he was scheduled to start a critical division clash against the Indians at Progressive Field. It’s an injury that has been bothering Zimmermann for some time, manager Brad Ausmus said later on Monday, but didn’t reach a critical point until he struggled to throw off the mound at Progressive Field on Monday afternoon. The injury may have been behind his decline in production as his K%-BB% has gone from 12.1% to 11.4% to 8.7% over the season’s first three months. • Wade Davis is out with a strained forearm. Almost no quotes yet on the extent of the injury, but Andrew Heaney’s DL stint started out with a “strained forearm” and he just had Tommy John surgery last week. • Jameson Taillon is hurt again, but this time with shoulder fatigue. 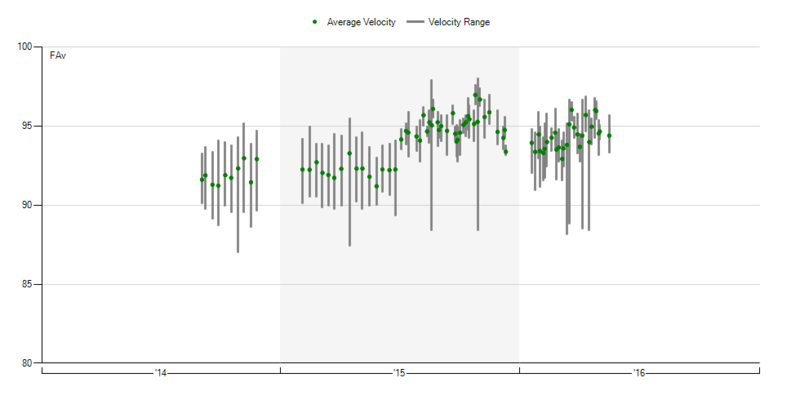 Fatigue is vague so I went and looked to see how pitchers did with shoulder fatigue. Of the 12 instances, two were over 100 days on the DL. The other ten were between 15 and 45 days. 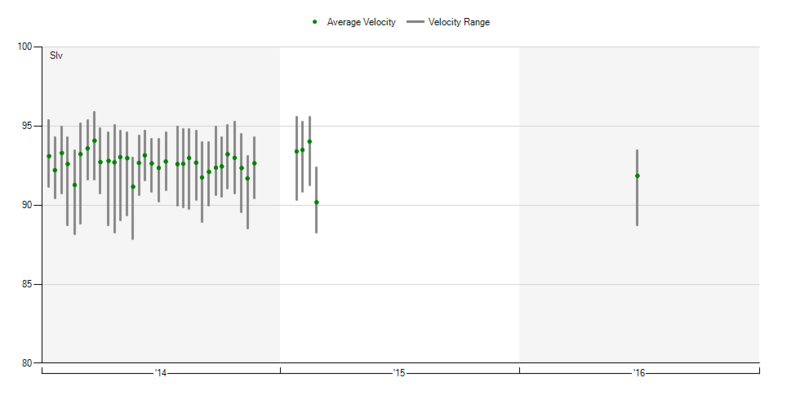 • The Nationals noticed Joe Ross had a velocity drop and then the Nats found out his shoulder was ailing him. Ross showed signs in Saturday’s 9-4 loss to the Reds that there was something wrong with his shoulder. 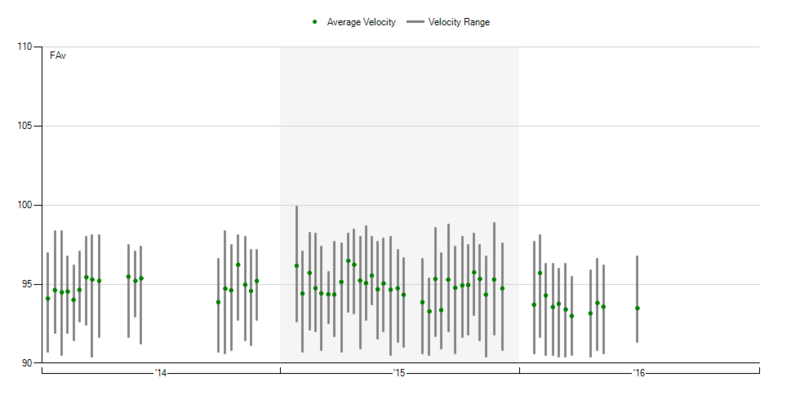 Ross has a sinker that averages 93.5 mph, according to Brooks Baseball. 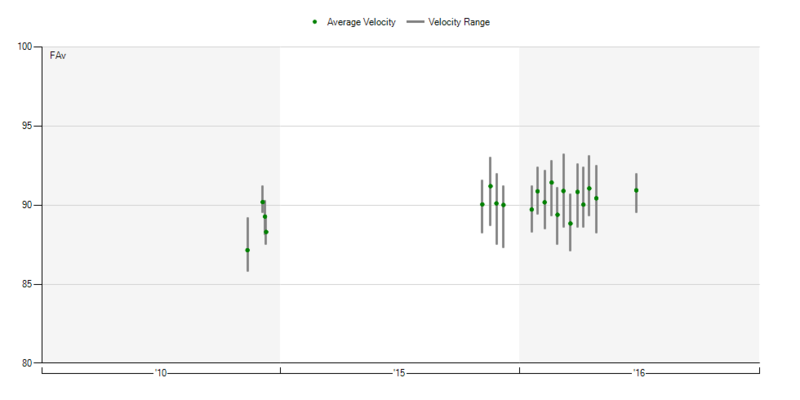 It listed his sinker as only averaging 91.8 and sitting in the high 80s during the fifth inning. At first, Ross said he was OK. He just had poor command. But when he arrived at Nationals Park on Sunday morning, manager Dusty Baker wanted Ross to tell the truth about his shoulder. Ross confessed that he had shoulder discomfort. Ross then went to the hospital to have an MRI and it revealed the inflammation. • Desmond Jennings is out with a strained hamstring. Jennings exited the Rays’ 10-7 loss on Thursday after rounding first base awkwardly on a double. He was on the bench for precautionary reasons the next two days, and Rays manager Kevin Cash said on Sunday that Jennings was feeling better. • Joc Pederson is temporarily on the DL with a strained shoulder. Sounds like he will only be on the DL for the minimum 15-days. Dodgers manager Dave Roberts said Pederson would receive a cortisone shot and implied that the outfielder would still be on the active roster if it weren’t for the upcoming All-Star break. • Trevor Plouffe has a cracked rib and expects to be out a month. Trevor Plouffe’s injury woes this season continued on Monday, as the third baseman was placed on the 15-day disabled list with a fractured left rib, and he’s expected to be out for roughly a month. Looking at past cracked/fractured rib injuries, the return time should be around 40-45 days. • Matt Davidson will be out for a while with a broken foot. Right now, he is supposed to stay off of it and then get an X-ray in two weeks to see how much it has healed. Davidson underwent successful surgery at Rush University Medical Center on Friday, as a screw was inserted to repair the fracture in a procedure performed by Dr. Simon Lee, the White Sox foot and an-kle specialist. In two weeks, Davidson will be re-evaluated with a new X-ray. The White Sox will determine a long-term plan for recovery at that time. • Sean Doolittle will at least be out until after the All-Star game with a strained shoulder. There’s no timetable for his return, but the issue is considered minor. Doolittle has been prescribed ice and rest, with no need for surgery or even an injection. • Chris Coghlan will be out with a strained rib cage. • Fernando Rodriguez is headed to the DL with a strained shoulder. • Josh Phegley was placed on the DL with a strained knee. The A’s placed Josh Phegley on the 15-day disabled list with a right knee strain Sunday, marking the second time this season right-knee troubles have sidelined their backup catcher. Manager Bob Melvin said the team is mulling over an MRI of Phegley’s knee and acknowledged “there’s a potential” for surgery. All right, that is too much information on a backup catcher. Moving on…. • T.J. McFarland is on the DL with a knee injury. • Erik Johnson will be out 3-6 weeks with a strained elbow. • Ryan Goins heads to the DL after having to pitch in a 19-inning game. • Alex Colome is expected to come off the DL later today. • Daniel Norris, while not officially on the DL, will likely miss a month with a strained oblique. • In today’s game of players I have never heard of, Conor Mullee is headed to the DL with hand numbness. 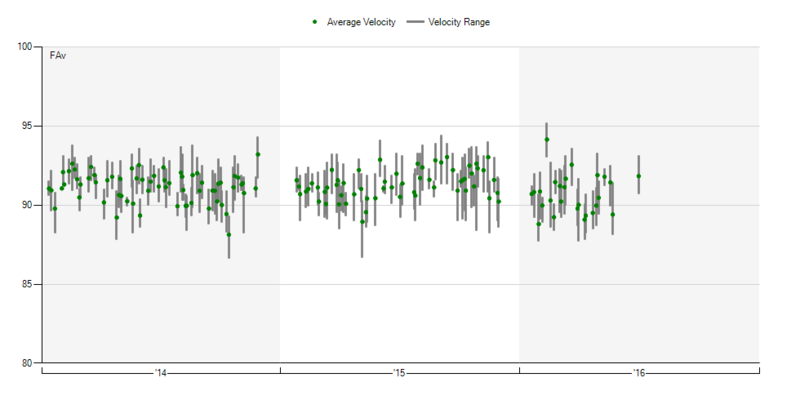 • Andrew Cashner’s average fastball velocity is consistent compared to before going on the DL, but still down compared to previous seasons. 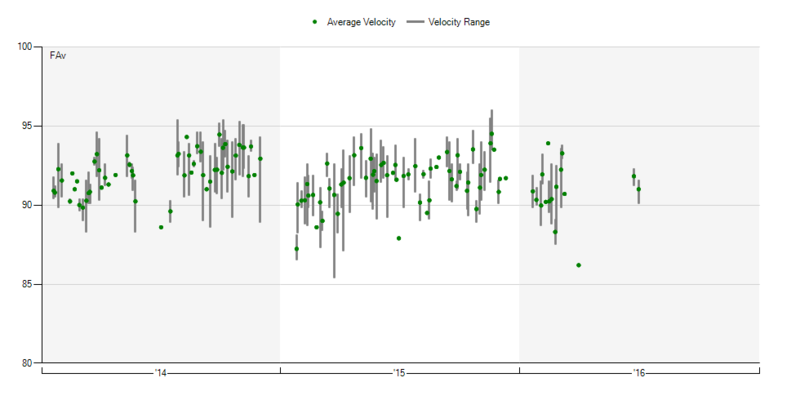 • Brett Cecil’s average velocity is fine. 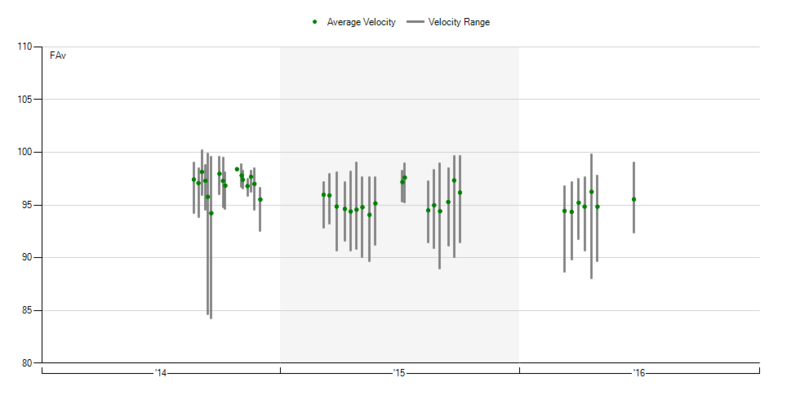 • Mike Foltynewicz’s velocity is the same when compared to his other starting velocities. • Rich Hill’s is the same. • Trevor May’s is fine. 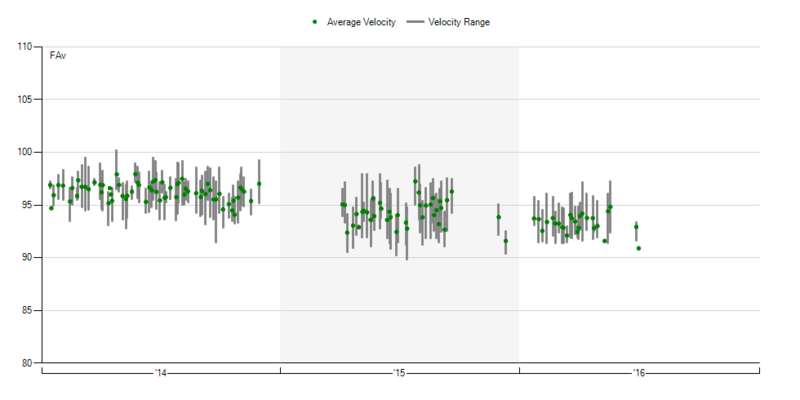 • Brandon McCarthy velocity is also fine. 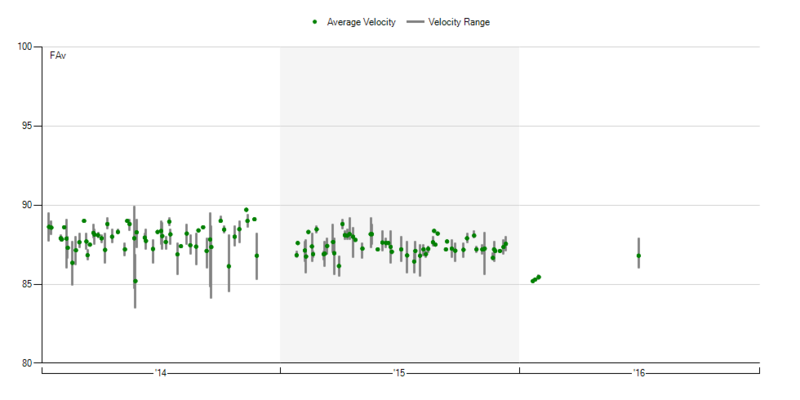 • Jake McGee’s velocity is down ~2 mph. 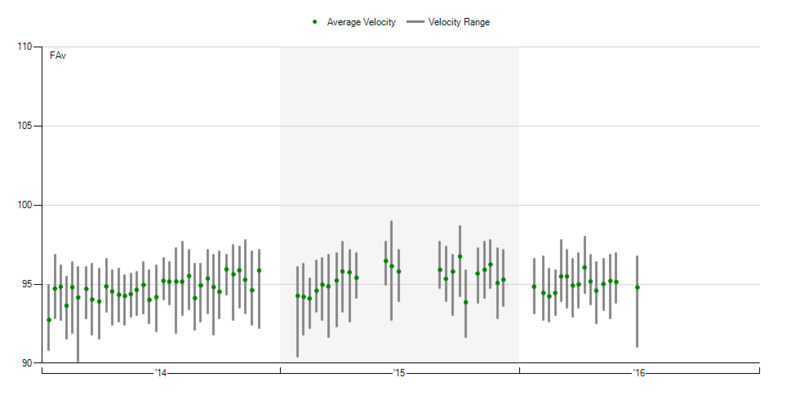 • Jonathan Papelbon’s velocity was near a season high. • Sergio Romo’s is also fine. • Joe Smith is also. • Vance Worley’s is down a couple mph from his previous level. We hoped you liked reading MASH Report (7/5/16) by Jeff Zimmerman! 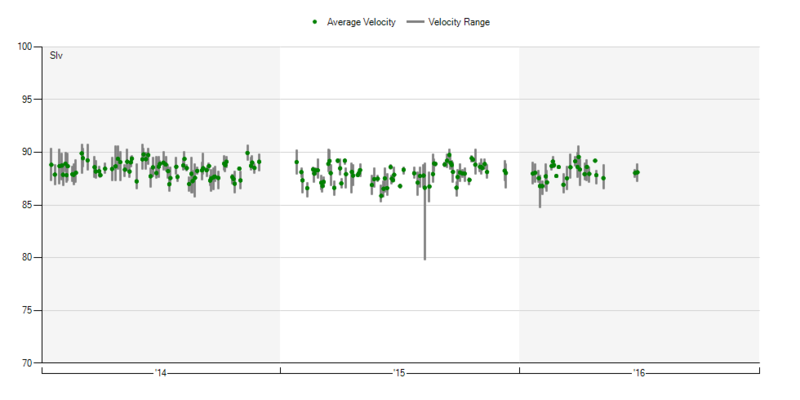 The Change: Who’s Suppressing Exit Velocity Better? 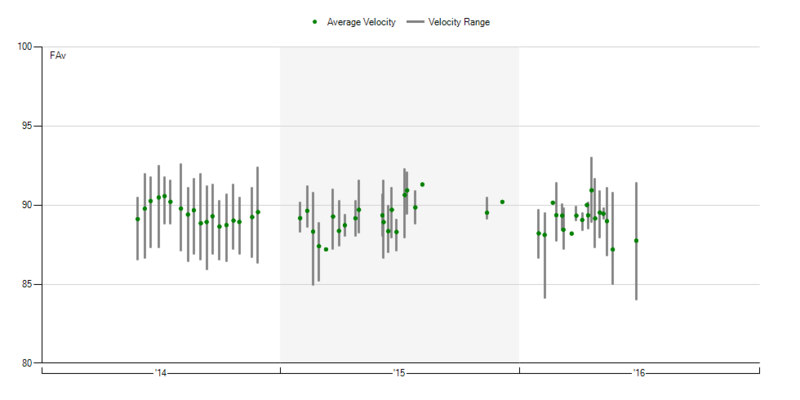 It was nice of Sergio to actually throw a fastball for you to gauge.